Here we can see the results of a tree allowed to mature with no previous thoughts of crown structure. 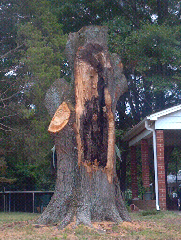 You can see how one side of the tree was completely ripped of exposing internal decay. An over-extended co-dominate stem combined with some internal decay resulted in this trees demise. If care had been taken earlier in the life of this tree to prune for one dominate leader, and well placed scaffold limbs, this tree would still be intact. Compaction for the Sake of Grass? To Stub or not to Stub?